As the U.S. vetoes a UN Security Council measure on Jerusalem, it is also protecting Israel’s deadly attacks on Palestinian civilians, including one that killed a wheelchair-bound double amputee. TRNN’s Aaron Maté speaks to Yousef Munayyer of the US Campaign for Palestinian Rights. AARON MATÉ: It’s The Real News. I’m Aaron Maté. The Trump administration sparked global outrage when it recognized Jerusalem as Israel’s capital and said it would move its embassy there. Now it’s undermined a global response. On Monday, the U.S. vetoed a UN Security Council measure critical of its Jerusalem decision. U.S. Ambassador Nikki Haley called the measure an insult. NIKKI HALEY: What we witnessed here today in the Security Council is an insult. It won’t be forgotten. It’s one more example of the United Nations doing more harm than good in addressing the Israeli-Palestinian conflict. Today for the simple act of deciding where to put our embassy the United States was forced to defend its sovereignty. The record will reflect that we did so proudly. AARON MATÉ: Joining me now is Yousef Munayyer, executive director of the U.S. Campaign for Palestinian Rights. Yousef, welcome. Let’s start with Haley’s remarks there saying that the U.S. was forced to defend its sovereignty and veto that UN measure. Your thoughts on what she said? Y. MUNAYYER: Yeah, thanks for having me. Obviously every state around the world has a sovereign right to determine what it recognizes, but at the same time they don’t have a right to then expect that the entire world can take them seriously if those decisions fly in the face of an international consensus about the territory that they recognize. Well in this situation the United States decided to break with decades of its own policy, decades of international consensus around the question of sovereignty in Jerusalem, which going back to 1947 through United Nations resolutions, the international community has determined that the status of Jerusalem is one that is separate and has an international dimension, and that any recognition of sovereignty over Jerusalem between Israelis and Palestinians would be subject to a negotiated outcome. So the United States is obviously free to determine whatever its policy is, but at the same time it can’t expect that the international community will stand by and accept whatever determination it makes. I think that’s exactly why you saw the vote at the United Nations Security Council go down the way that it did. AARON MATÉ: Now a lot of commentary pointed out that the U.S. has isolated itself on this issue. But I’m wondering if you can talk about the extent to which you think previous administrations laid the groundwork for Trump’s decision. This is not the first time that the U.S. has vetoed a measure at the UN critical of Israel. It’s a long history to go through, but I’m wondering if you think that the commentary that we’ve seen around this issue has downplayed the role of previous White Houses. Y. MUNAYYER: Well look, the U.S. 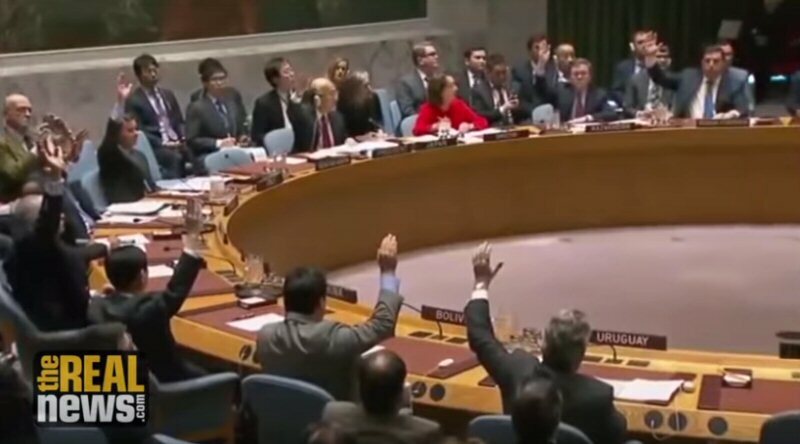 Ambassador to the United Nations casting their veto in order to protect Israel from international opprobrium is a time honored bipartisan American tradition. It’s something that has been going on for decades now, and in fact over 40 instances of the United States being the single solitary no vote and veto on United Nations Security Council resolutions critical of Israeli violations of international law have taken place over the last several decades since the 1980’s. So no, this is not something new. In fact the Obama administration cast a veto to protect Israel from a UN resolution condemning settlements back in 2011. And that was I believe the only veto that the Obama administration had ever used at the United Nations Security Council. And now this is the first that the Trump administration exercises at the Security Council. So this is something that has happened before, and of course American administrations have consistently played the role of protecting Israel as it continues with this occupation and the process of colonizing Palestinian territory. AARON MATÉ: So let’s talk about what’s happening on the ground. Over a thousand Palestinians have been wounded since protests broke out over Trump’s Jerusalem decision. There have been a number of deaths. And let’s talk about just a few of them. One of the most prominent cases to get attention is that of Ibrahim Abu Thuraya. He is a wheelchair-bound Palestinian man. He lost his limbs in a previous Israeli strike, and then as he protested against the Jerusalem decision near the Gaza border, he was shot dead by an Israeli sniper. The Israeli military on Monday just cleared itself of wrongdoing in that case. Can you talk about what happened there? Y. MUNAYYER: Right, so here you have an instance, as you noted, of a Palestinian who was disabled, that had lost both of their legs in previous Israeli airstrike on Gaza. And despite that made protesting Israeli oppression an important part of their lives. Routinely he would go down to the demarcation between Gaza and where the Israeli forces are to wave a Palestinian flag. He was known for climbing to the top of towers and displaying the Palestinian flag on high as part of his symbolic protest to the Israeli presence there. And nonetheless he too was targeted and killed by Israeli snipers attempting to repress a Palestinian protest after of course the decision of President Trump in recent days.So the fact that a wheelchair-bound double amputee is not someone who can expect the protection under international law and the rules of engagement while protesting non-violently, it makes you wonder who, if anyone at all, could expect protection and could expect their rights to protest to be safeguarded before this Israeli military presence. AARON MATÉ: Just to update those figures I gave before, there have been at least 10 Palestinians killed and over 2,800 wounded according to Al Jazeera. Finally Yousef, the PLO said today it’s going to renew a push for full membership at the UN. It reaffirmed a previous announcement that it will no longer consider the U.S. a partner in the so-called peace process. Your thoughts and concerns about what the Palestinian strategy should be from here? Y. MUNAYYER: Well I think right now there is no clear Palestinian strategy that has been enunciated by the so-called Palestinian leadership or the official Palestinian leadership that’s recognized by the international community. And that’s a big part of the problem. From the leadership of the PLO there’s a series of tactical responses that have been outlined, but no real clear strategy for how people achieve national liberation. What we hear is all this talk about applying to this international agency or putting a complaint in with this international court or what have you. But how that is going to actually translate into the kind of pressure necessary to press Israel into ending its occupation of Palestinian territory and finally afford Palestinians the basic human rights they deserve, none of that has been elaborated by the Palestinian leadership.And I think what this moment with the declaration of Jerusalem as Israel’s capital by the President of the United States makes clear that this strategy or this approach of attempting to achieve national liberation through negotiations mediated by Washington is as bankrupt as it has ever has been before. And so there is a demand now, I think a very clear demand for an alternative strategy that actually holds some promise, and not merely the kind of tactical responses that can subdue perhaps public anger in this moment, but act as nothing more but a cover for continued colonization in the years to come. Y. MUNAYYER: Well there’s a number of obstacles that we face here of course. Part of it is just a great deal of ignorance unfortunately about the situation. And also a great deal of misinformation that is being effectively produced by those who are supportive of Israeli apartheid. And too often the American media is very much complicit in disseminating this information and also preventing accurate information from reaching American audiences that desperately need it to inform policy makers about what a proper policy would be towards achieving a just peace for Israelis and Palestinians alike. 12/15/17 Palestinians Stand Up to Israel, Will the World?